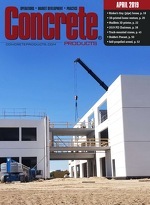 CEI charts the strength development of a concrete mix designed with 470 lbs. of cement/yard and produced in a Fusion Hybrid-Process plant, where aggregate blending minimizes voids in finished slabs and structures. The cement factor is 17 percent below that of a mix design for a standard 4,000 psi compressive strength target concrete.